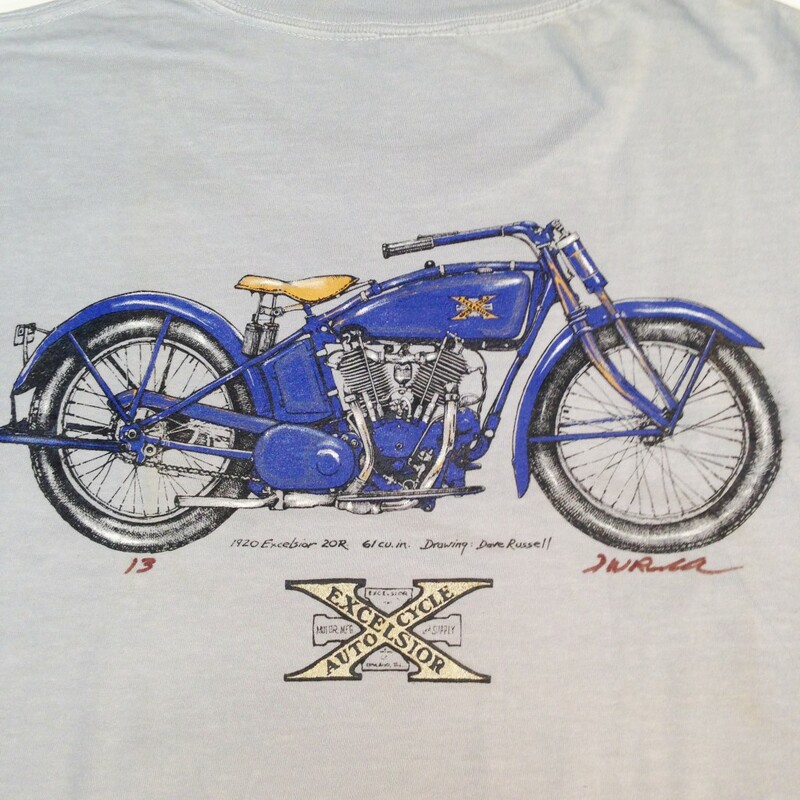 The T-shirt with printed image—a phenomenon dating largely to the 1950s, exploding in popularity in the 1960s, and with its ancestral roots in post-World War I returning servicemen—is an ideal medium for proclaiming classic motorcycles. 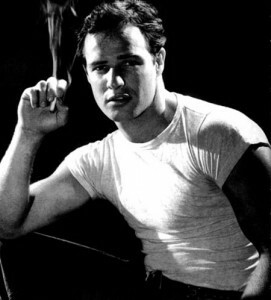 Interestingly, Marlon Brando, the actor whose portrayal of a motorcyclist in 1954’s The Wild One established the aesthetic of the “motorcycle look” forever after, also invigorated the wearing of the t-shirt as an outer garment a few years earlier in 1951’s A Streetcar Named Desire. 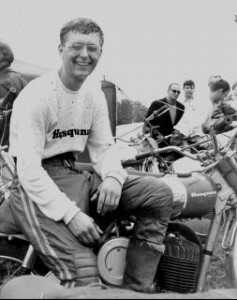 Decades later the t-shirt is the go-to garment for much of the world, and remains an essential aspect of motorcycle style. First, let us define what we mean by “t-shirt” (or, “tee-shirt”). The t-shirt is an upper body garment—either short- or long-sleeved and in the shape of a “T”—usually of lightweight cotton/jersey fabric, and able to be worn as an undergarment. T-shirts were traditionally made with a round, reinforced “crew” neck, though recent styles have incorporated “V” necks. Such shirts had been worn as underwear from the late 1800s and into the 1900s, though they were sometimes worn without an outer garment, especially when the work was hard and dirty. Patterned t-shirts—designed as outerwear and often made in bold stripes—became popular for young men and boys throughout the late 1940s and 1950s. The idea of printing slogans and images on t-shirts originates for the most part in the 1950s. It was the 1960s, however, with protest and change in the air, which incontrovertibly made the previous undergarment and casual young person’s item the new canvass for self-expression. 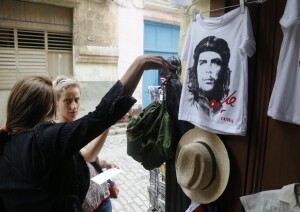 Slogans and catchy images (such as “I(heart)NY” and the face of South American guerilla leader Che Guevara) became popular with younger people. The t-shirt was not only cheap to buy and comfortable to wear, but also easily made into a vehicle for personal statement. Many of the messages on early printed t-shirts conveyed an anti-establishment or blue-collar vibe on the part of the wearer (helping to self-identify the wearer as an individual), and could furthermore channel very specific proclamations. This secondary idea might be political (“STOP THE WAR!”), social/cultural (“Grand Funk Railroad, 1974 World Tour”), or simply to impart shock value (marijuana leaf). 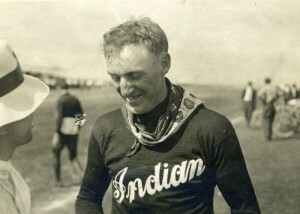 The t-shirt as motorcycle garment likewise relates to its ease of wear, and also to the custom—dating to the first Harley-Davidson-Indian competition ‘wars’ of the early 1900s—of proclaiming one’s loyalty to a particular brand of machine by having the wearer’s brand emblazoned on his shirt. While this practice is not confined to motorcyclists (automobile enthusiasts share this custom), we might still note that proclaiming loyalty to an industrial object is curious, to say the least. After all, few of us would voluntarily seek out t-shirts proclaiming “Frigidaire” or “Proctor & Gamble.” The answer to this question reflects the loyalty motorcyclists felt not only to their brand, but to other motorcyclists who similarly rode and supported the same brand. The riders of a particular motorcycle saw themselves, in effect, as members of an unofficially united team. Thus we see in more recent decades the use of the [somewhat European] phraseology of “Team Suzuki” and “Team Honda” (juxtaposing the normal American convention of modifier/object, as in the Suzuki Team). The motorcycle-brand t-shirt, sweater, or jacket not only self-identified the wearer as a motorcyclist—with the attendant images of risk, daring, and speed—but also as a member of a social unit. The Vintage Motor Company continues this tradition of self-expression and group identification, with our line of classic motorcycle shirts. Looking especially to the “Golden Years” of the early 1970s world-wide motorcycle boom and adjacent decades, the Vintage Motor Company recreates the machines of the era when motorcycle brands were indeed unique. Unlike the recent products of the now-dominant Japanese “Big Four,” the world motorcycles of the 1960s through the 1980s looked and performed differently from one another. Far from being the nearly-identical technology (though wrapped in different colors of plastic) available today, these early machines were the efforts of young engineers with manual slide-rules, figuring out what would really work in a period of immense change. We are proud, in turn to be members of their team! Which team do you belong to? Check out our latest, hand designed classic and European motorcycle t-shirts at our product page…and as always, make sure to read our weekly articles highlighting the best in vintage motorcycle culture! The Che Guevara image subsequently came in for ridicule and denunciation, with the later revelations of Che’s cruel and violent history. This desire to self-identify as a part of a larger social unit is particularly evident today in Harley-Davidson social culture. This entry was posted in classic motorcycle t-shirts, European motorcycle t-shirts, motorcycle art, Motorcycle as art, Motorcycle Culture, vintage motorcycle t-shirts and tagged classic motorcycle t-shirts, European motorcycle t-shirts, vintage motorcycle culture, vintage motorcycle t-shirts. Great post! I used to wear Harley shirts all the time as a teenager. Along with concert shirts. I am not able to wear them quite as often these days due to the fact that I am usually in a situation most days I have to look all “proper”, whatever that means. I do wear them as much as possible, that’s when I know I’m on my own free time. Thanks Robin, glad you enjoyed it! 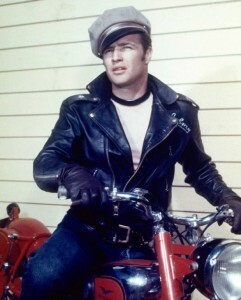 As far as I could tell, this is the first article on the web examining the T-shirt and it’s role in motorcycle culture. Thanks again for the comment. I loved to wear all kinds of T-Shirts in those days. Most of them had Rock Bands names on it, or a political statement which was popular at the time. I still love wearing T-Shirts when working at home or in the Garden. They are comfortable and I just love it. Glad you liked the article Sylvia! Now I get to work on producing great t-shirts and live out my teenage years! great information regarding vintage shirts. Great use of colors and vintage photos. You also has social accounts connected. I would suggest maybe a newsletter, maybe some web sites partners, lets say a motorcycle company and advertise a vintage motor and get a free shirt as a bonus, maybe adding more vintage products, such as old watches, old leather jackets, etc. Great suggestions Walter! We are definately working on a newsletter and yes, authoritative site partners is an idea we’re playing with also. Thanks for the comments! 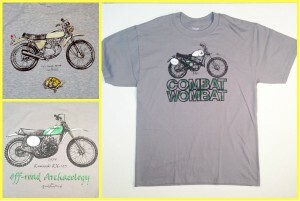 Great post on the role of the t-shirts in the motorcycle culture. I love the history lesson about the development, evolution and use of t-shirts. It is amazing how people can use t-shirts to drive a message. Today, many groups make t-shirts for identification especially colleges. Like you mensioned, a t-shirt let people know where you belong. Thanks Denise. The T-Shirt defiantly plays a unique role in motorcycle culture and history…and as you can tell; we at the Vintage Motor Company try to stay fashion forward!